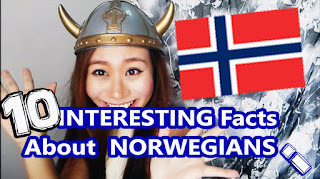 Top 10 Interesting Facts about Norwegians ! Ever wondered all caucasions, europians, Ang Mos are the SAME?? NO !! Especially Norwegians! They are one of a kind and here are some facts about them! It's because Im not a Norwegian that's how I found out HOW Interesting and Indifferent they are from my culture ! If u ask my what's Interesting about Malaysian, Id say Food, language but There are still certain things we didn't realize is much funnier to the foreigners than to us ! That's because they practice a different culture as well !